Have You Lost Yourself in Your Kids? This was a comment left on the I Just Want to Pee Alone Facebook page. As soon as I read it, I knew I had to share it with everyone. Dede Sylvester put into words exactly how I feel every single day. I bet you'll feel the same way. A friend with no children asked me the other day if I ever feel like I've lost myself in my kids. I really had to stop and think about how to answer. I guess I've given up a lot. I've given up late night parties, sleeping in, naps, going to bed early, hell, sleeping in general. I've given up massages, regular haircuts, new clothes, a clean house, cooking big, elaborate meals, and going to the bathroom by myself. I can no longer read more than a few pages of anything at a time,watch non-animated movies or walk through a room without stepping on a Matchbox car or a monster truck. My body is no longer my own, I am a human jungle gym and the idea of "personal space" is completely foreign to both my boys. But I can't say that I've lost anything. Quite the opposite in fact. I've found things. I've found kindness in the stranger who opens the door for me when I'm balancing a baby, a toddler, and two bags of groceries or from the man next door, who out of the blue one day says to me "I want you to know that I can hear you outside playing with your boys and I think you're doing a great job." I've found compassion every time I see a sick infant or read an article about an injustice done to a child. YES, I will donate to your cause. YES, I will sign your petition. 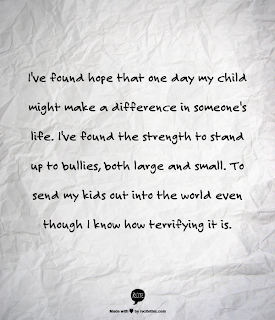 YES, I will share your post in hopes that your child's voice will be heard. I've found hope that one day my child might make a difference in someone's life. 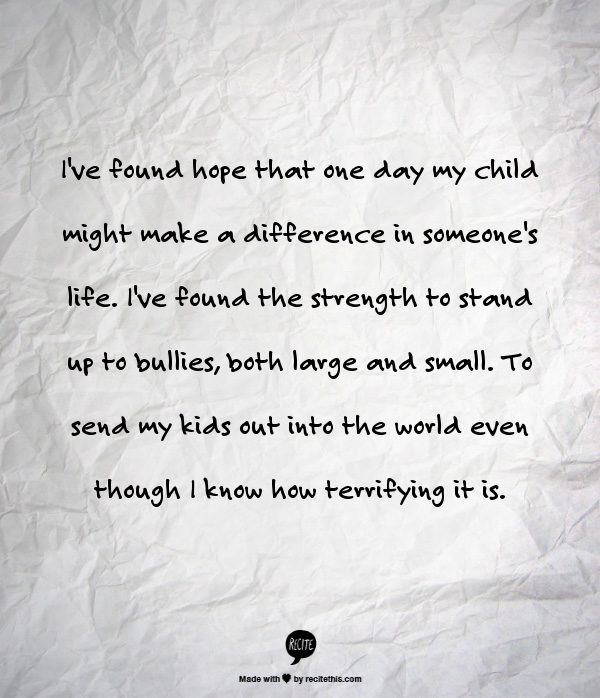 I've found the strength to stand up to bullies, both large and small. To send my kids out into the world even though I know how terrifying it is. I've found the courage to be silly in public. To pretend to be a monster truck and jump in puddles in the grocery store parking lot. To dance like an idiot in front of 200 people I will (hopefully) never see again. I found my inner child. The one that I thought was long gone, crushed by overdue bills and laundry and the hum-drumity of every day life. I've found the patience to sing "Itsy Bitsy Spider" 5, 10, 20 times in a row. To watch the truck episode of Bubble Guppies until I know all the songs by heart. To get out of my warm bed again and again and again to rock a sick child. I found love like I never knew existed and I find joy every time they laugh. Every. Single. Time. But mostly, I found my future. I found a reason to get out of bed every day, to go to work, to take care of myself, to reduce, reuse, recycle, to share my bacon and make Halloween costumes and hide Santa presents in the suitcase in my closet. So no, I didn't lose myself, I found myself in these two little people that I'm building. Dede Sylvester is a 43-year-old working mom with two boys under the age of five. She enjoys being a mom and writing. First off, for those that don't know, my mom passed away tragically and suddenly in 2006. So, before I start, I have to say this: Mom, God rest your soul. You are dearly missed. We all love and miss you tons. Amen. Ok, now what I really want to say is: Mom, you sneaky little snake! 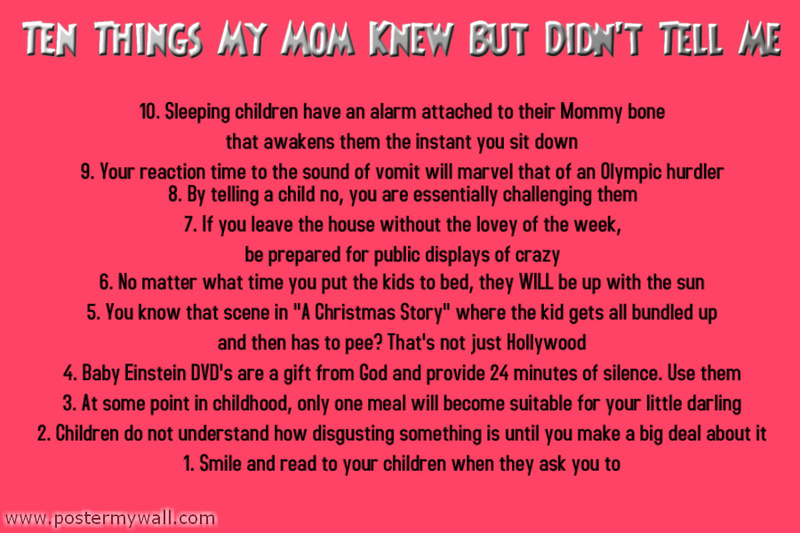 How dare you keep all these Mommy secrets to yourself! Anyway, in my two and a half years of Mommyhood, I have learned many things that I never thought I'd ever need to know. Of these things I've learned, I have realized how truly essential they are to remaining sane as a Mommy. 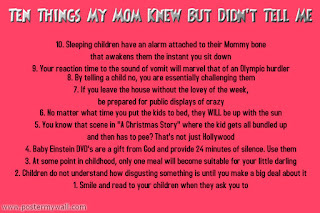 So, here are ten of the things I have learned in my Mommy life. Shake up a cocktail and take notes. 10. Sleeping children can sense the moment you sit or lay down, start to read a book, clean, cook or do anything not child related. There's like an alarm attached to their Mommy bone or something. Seriously. 9. Your reaction time to the sound of vomit will marvel that of an Olympic hurdler. 8. By telling a child no, you are essentially challenging them. Pick and choose your battles. 7. If you leave the house without the lovey/stuffy/blankie/friend of the week, be prepared for public displays of crazy. Regardless of how far you've gone, either stop to buy a new one or turn around to get the one you forgot. 6. No matter what time you put the kid(s) to bed, they will undoubtedly be up with the sun. 5. You know that scene in "A Christmas Story" where the kid gets all bundled up and then has to pee? That's not just Hollywood. That's real life, people. Same rule applies when entering any type of watery fun, including bathtime. 4. Baby Einstein DVD's are a gift from God and provide 24 minutes of silence. Use them. 3. At some point in childhood, only one meal will become suitable for your little darling. Keep it in stock both in your house and in the diaper bag. Bring it to restaurants or only go places that have it on the menu. Or stay home. 2. Children do not care or understand how disgusting something is until you make a big deal about it. It is only then that the poop on the ground or the smashed bug or the puddle of vomit becomes exponentially more interesting. 1. 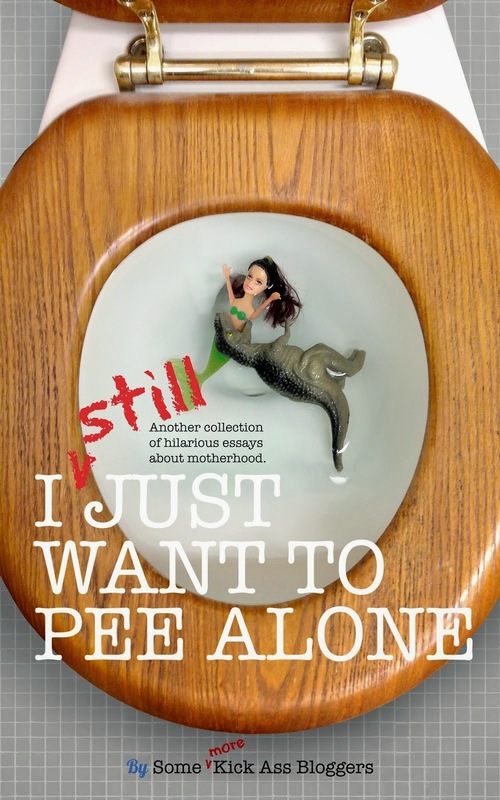 If you are asked to read the same book for the 1,756th time, do it. Don't grumble. Don't huff. Don't slam down the last dish in the sink. Smile and read to your baby. One day, you'll be begging for them to look at you, let alone ask to spend time with you. This was originally published on Mommy Needs a Martini. Jeannette is a wife, going on 7 years, and a full-time working Mommy to two adorable and very opposite little girls under age 3. My life consists of work, diapers, bottles, stories, naps, power struggles, booboo's, attempts at crafts and, of course, martinis!